and a different vitola. For 2012, the White Edition is a Robusto Gordo. 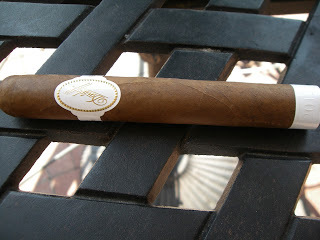 I recently had an opportunity to sample the Davidoff White Edition 2012. Overall, I found this a very good cigar and one that fans of Davidoff blends should be very satisfied with. Like the Davidoff White Edition 2011, the White Edition 2012 makes use of a Dominican Criollo wrapper. The binder and filler on the White Edition 2012 differ from the White Edition 2011. The Davidoff White Edition 2012 is available in one size a 5 3/4 x 52 Robusto Gordo. While the Davidoff White Edition 2012 has a Dominican Criollo wrapper like the White Edition 2011, but has a much darker shade. I would categorize the wrapper of the Davidoff White Edition 2012 as being a medium brown wrapper with a colorado tint. The wrapper itself has a silky complexion. There are minimal visible veins and the wrapper seams are well hidden. From the foot there is a classic farm-like Davidoff aroma. There are two bands on the Davidoff Limited Edition 2012 White Label. The first band is similar to the classic Davidoff White label. It features the name “Davidoff” in classic cursive gold-colored font on an oval field of white. There are small gold circles going around the perimeter of the oval. The word “Geneve” (in gold font) flanks to the right of the oval field. To the left of the oval it features the text “White Label”. The second band is on the footer. It is also white in color and has “2012” in an embossed-like fashion. For my smoking experience of the Davidoff White Edition 2012, I opted to go with a straight cut into the cap of the cigar. After starting the pre-light draw, I was treated to some classic Davidoff flavors. The dry draw notes yielded a combination of grass, hay, cedar sweet/spice, and a touch of cinnamon. Overall, this pre-light experience did not excite me. It wasn’t bad, but I’ve found most dry draws from the Davidoff line have usually not wow’d me. However, these same cigars have provided solid smoking experiences. It is worth mentioning that we do not factor the pre-light experience into our cigar assessments. At this point, it was time to fire up the White Edition 2012 and see what the smoking experience would bring to the table. After lighting the Davidoff White Edition 2012, the flavor profile of grass and hay that was found on the pre-light draw continued at the start. While these flavors did not wow me on the pre-light, the fact that they had some more depth – and would be complemented by additional flavors made this flavor profile much more interesting. The grass and hay notes were joined by black pepper notes and the pepper moved out into the forefront. The pepper settled down quickly and went on even ground with the hay and grass notes. Around the five percent mark, some natural tobacco sweetness surfaced in the background. The natural tobacco sweetness never really took control of this smoke – and remained in the background for most of the smoking experience. In the second half, the pepper once again moved into the forefront. The grass and hay notes moved into the background and joined the natural tobacco sweetness. The pepper notes held until the close to the cigar smoking experience. While the finish was peppery, it was not harsh. The resulting nub was ideal – it was firm to the touch and cool in temperature. I have found the limited edition cigars from Davidoff to always have outstanding construction and the Davidoff White Edition 2012 was no exception. The great construction was reflected in the attributes of burn and draw of the White Edition 2012. The burn line remained relatively straight with minimal touch-ups. There was a slight bit of flaking of the ash, but for the most part the resulting ash was firm. The burn rate and burn temperature were ideal. As for the draw, this gets high marks – making the White Edition 2012 an enjoyable smoke. I found the White Edition 2012 to have more strength and body that the White Edition 2011. The White Edition 2012 has a nicotine kick that will sneak up on you. The cigar starts out medium strength and slowly builds up more strength as the smoking experience progresses. By the midpoint of the White Edition, the cigar is medium to full-strength. By the end of the smoking experience, the cigar has just enough kick to make this a full strength smoke. The depth of the flavors surprised me a bit with the Davidoff White Edition 2012. The flavors started out medium to full-bodied and progressed to full-bodied in the second half. The White Edition 2012 surprised me because the White Edition 2011 was more a classic medium-bodied smoke. In terms of balancing the strength and body, I give the body a slight edge over the strength. When I assessed the Davidoff White Edition 2011, I mentioned that Davidoff smokes usually aren’t in my profile. At the same time I also mentioned the White Edition 2011 was still a smoke I’d reach for. I can attest that the White Edition 2012 falls into this category. The cigar is going to deliver more “zing” than the 2011 as it is going to have deeper flavors, more strength, and more spice. The SRP of this cigar is $21.50. and while we don’t factor price into assessment ratings and scores, it still is important to mention this to the end consumer. Given this cigar has some strength, I would probably not recommend this to a novice cigar enthusiast. As for experienced cigar enthusiasts, I’d recommend this – especially for Dominican tobacco fans. This is a cigar I look forward to smoking again. Source: The cigar for this assessment was purchased from Burns Tobacconist in Chattanooga, Tennessee.